After all the angst of posting with pictures yesterday, I ended up not sayin' much about the two projects whose pics I did successfully post, and there are a few things I wanted to say about them. First of all, I love the Berocco Pleasure yarn - it's incredibly soft, easy to work with and shows stitch detail very well. It's a heavy worsted weight yarn so it knits up really quickly. 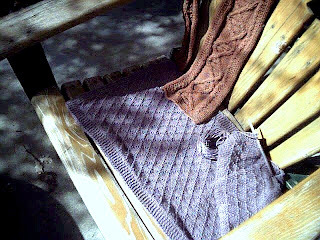 I used size 9 (U.S.) needles for both projects. The yarn is not being made any more, but you can find it on eBay at reasonable prices. When I made the Human Genome scarf, I learned how to cable without using a cable needle. I did great with this technique as long as the "loose" stitches were held in the front...When they were behind the needle, more often than not, they would begin to "drop" and I would have to fish them back up again using a crochet hook. This took longer (and was more frustrating) than using a cable needle in the first place. I kept trying to analyze the process while I was doing it - why are those stitches wanting to run away? But didn't get to the point of fully understanding the problem - at least not enough to prevent it from happening. So, I'd have to say that my success rate with this new-to-me technique was only about 50%, but it was/is still worth it. Not having to keep track of the cable needle, pick it up and use it for every single cable crossing (and there were lots of them in that scarf!) was a good thing. The pattern for the Human Genome scarf is from Interweave Knits, Fall 2003. I made it pretty much according to the pattern, but I substituted stockinette stitch for the long borders because I knew they would curl under and I thought that would provide a soft edge to go along DH's neck. I really like how it turned out. 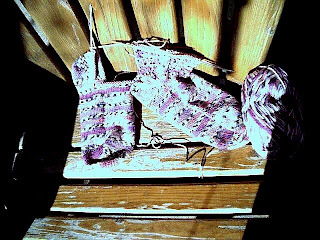 I'm also working on a pair of socks, using Wendy's generic toe-up pattern with her Feather and Fan pattern for the legs. (Size 2 needles for the feet, and size 3 needles for the legs & cuffs.) I have large feet, thick ankles and "muscular" (read fat) legs, and don't know how long to make the legs/cuffs - don't want to run out of yarn, so I knitted the first sock and did a couple or three repeats of the Feather & Fan on the legs, and then began the second sock. I plan on knitting it to the same point and then go from there with what ever much yarn I have left to make the legs/cuffs of them both. 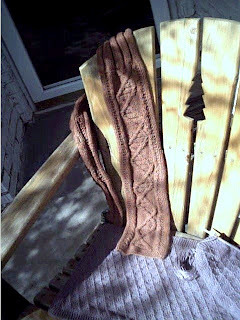 I tried the Feather & Fan pattern on a pair of socks last summer, but ended up ripping it out because I really didn't like knitting on #1 needles - very hard on my hands, and the fabric was so stiff and hard that it felt a lot like cardboard. The yarn I was using for that pair was gorgeous, and I will be using it for different socks (or maybe another Feather & Fan) but on larger needles. For the current pair I am using On Line 6 Ply that I bought here - 150 grams of sock goodness. By the way, I apologize for the sock pic. It doesn't do those socks justice at all!